Reading through the interview of Leah Karegeya – widow of Patrick Karegeya who died on New Year’s Day in Johannesburg – in the New Vision newspaper, it becomes clear that Rwanda National Congress’s (RNC) propaganda war on Rwanda has moved into Uganda’s mainstream media. The interview, published yesterday, Saturday April 13, can be exposed as an opportunity for Leah Karegeya, a card-carrying member of RNC, to air the group’s misinformation and gross misrepresentations of facts. However, it also reveals the symbiotic relationship between Museveni’s government, as Godfather of RNC, and the anti-Rwanda terror group itself. Leah Karegeya uses her full-page space in Uganda’s state-owned newspaper first to score cheap propaganda points for President Museveni – while simultaneously badmouthing his Rwandan counterpart and his administration – as she also airs every long-debunked RNC talking point as if it were undisputed fact. Karegeya’s widow carries water for Museveni in many ways, beginning with the very first misrepresentation of facts: that “Kagame has closed the borders”, when in fact all Rwanda’s borders are wide open – hundreds of Ugandans flock into Rwanda every day but Rwandans have been advised not to go to Uganda because of their security. The lady then goes on to claim: “He (President Kagame) does not remember the support President Yoweri Museveni gave to Rwandans!” This particular distortion of facts is one that Kaguta’s minions like to rehash, time and again. The reality they hate is that Museveni never would have beaten Obote were it not for Banyarwanda fighters. Museveni’s minions keep trying to make everyone forget the role the sons and daughters of persecuted Rwandan exiles played in his National Resistance Army (NRA), and the blood they shed in ushering him to power. “President Museveni is highly respected in the region and many Rwandans, including myself, perceive him as a father,” Madam Karegeya continues in a brown-nosing quote that no Rwandan, or self-respecting Ugandan will take kindly to. She is truthful in one respect, however, that Museveni is “a father to her”. The Ugandan leader is one of the main backers of RNC to which she belongs and for which she works. Museveni has been exposed, time and again as fully complicit in activities of the group on Ugandan territory. His intelligence organs actively work with RNC agents to recruit fighters that then are transported to training camps of the rebel group in Democratic Republic of Congo (DRC). He himself admitted early last year of knowledge of those recruitment activities, but only after his Rwandan counterpart showed him incontrovertible proof. Uganda’s intelligence operatives also work hand in hand with RNC agents to make life a living hell for any Rwandan on Ugandan soil that either refuses to be recruited into RNC, or that refuses to say bad, negative things about Rwanda and its leader. Those countless Rwandans that have been tortured in CMI’s (Uganda’s Chieftaincy of Military Intelligence) dungeons or “safe houses”, like Emmanuel Rwamucyo RUTAYISIRE, Augustin Darius Kayobera and his wife Claudine Uwineza, and their families, and their compatriots, will thank Leah Karegeya to limit her utterances that Museveni is “a father” to herself and to RNC. She then shifts to indicting President Kagame for the death of her husband, though no investigation has ever come up with a shred of evidence or proof. The truth that RNC propaganda (and all its friends) overlooks is that South African law enforcement strenuously investigated that death. They never came up with anything tying Rwanda to it. The Hawks, South Africa’s ultra-competent crime combatting agency combed the area and scoured Karegeya’s room for clues and minutely examined camera footage. They came up with nothing. However, NRC and all it’s friends, including individual state actors, will keep dredging up the case; they have weaponized it against Rwanda and won’t let it go. Normally, a professional news organisation will point out facts like that to its audience. Ugandan media, in matters to do with Rwanda, has quite clearly been instructed to carry water for RNC in all its propaganda efforts. The interview of Leah – coming hot on the heels of similar ones for other RNC bigwigs like Rujugiro and Himbara – will remove any last doubts that the New Vision now has become an organ to disseminate the message of RNC. Or to launder the image of this group whose grenades between 2010 and 14 killed 17 Rwandans and injured or maimed 400 others in public spaces like markets or bus terminals. 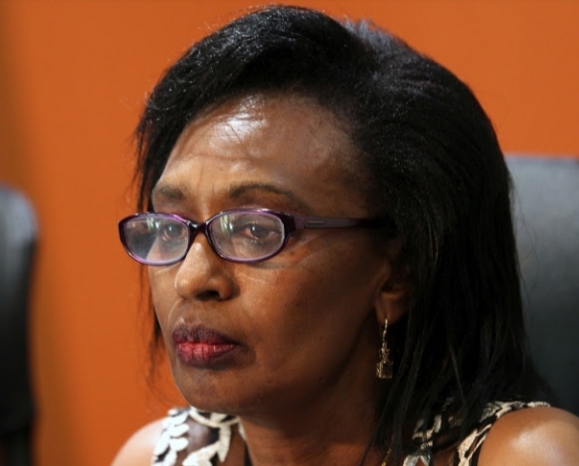 As if to disguise the identity of Leah Karegeya as merely “an innocent widow” nowhere does the interviewer mention that the lady is a member of RNC who has been fully complicit it the group’s crimes in Rwanda. It is obvious that to New Vision – or more accurately to its owners – the innocent Rwandan deaths resulting from RNC’s grenade detonations are to be disregarded. Far more important matters to them, like their shared scheme to destabilize Rwanda, are at stake! Another inconvenient fact that is left unmentioned is that, as one of RNC’s founders, Patrick Karegeya had declared war on the legitimate government of Rwanda. He and his fellow plotter Kayumba Nyamwasa are on record clearly stating their objective was to violently “remove” the government in Kigali. “Kagame will not leave power unless forced out by war!” Karegeya told The Observer newspaper of Kampala in August 2010. The things he was in the habit uttering on radio programs like the BBC’s Kinyarwanda, Kirundi language program Imvo n’Invano were much worse. He used the most emotive, violent language with the aim to stir up ever more hatred of the Rwandan administration. Patrick Karegeya, anyone interested in facts rather than propaganda knows, was someone with an outsized ego. He felt the state of Rwanda owed him much more than any other citizen. “He felt the position of chief of the External Security Organization was his God-given right, never to be taken away from him,” those that worked closely with him say. “When the post was given to another person, after Karegeya was implicated in ‘acts of corruption and gross indiscipline’, the man failed to handle it! He just could not cope without the trappings of power anymore!” a former friend of his that requested not to be named testified. Those with knowledge of Rwanda’s security forces say Karegeya’s problem, just like the problem of Kayumba and other deserters, is that they had a “Ugandan officer” problem.